Wele to SRG International Private Limited. Manufacturer and Exporter of Portable Cabins and Sound Proof Chambers. An ISO 9001 2008 certified pany, established in 2008 at Faridabad. We are a Member of IPAMA, FSCIA and UPCBMA. Transparent business policies, Compressive strength and durability are some of the key factors behind our success. We offer a wide assortment of Portable Cabins, Sound Proof Chambers and Pre Engineered Steel Buildings. Portable Cabins and Container Offices offered by us are best in the industry amongst others. Our Mobile Toilets and Industrial Generators are extremely reliable. Sound Proof Chambers and Pre Engineered Steel Buildings are acknowledged for their functionality. Our organization is specialized in manufacturing a qualitative range of Industrial Steel Racks and Sheet Metal Components. 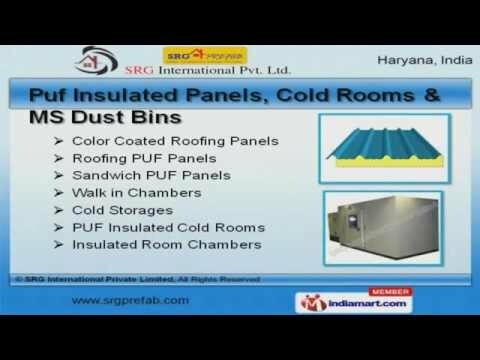 We have gained tremendous expertise in providing Puf Insulated Panels, Cold Rooms and MS Dust Bins. To Get More Information, Log On At www. S R G Pre Fab.